Language for Peace contributors Cheryl Woelk and Abby Long are leading a workshop as a Christian Teachers’ Symposium. 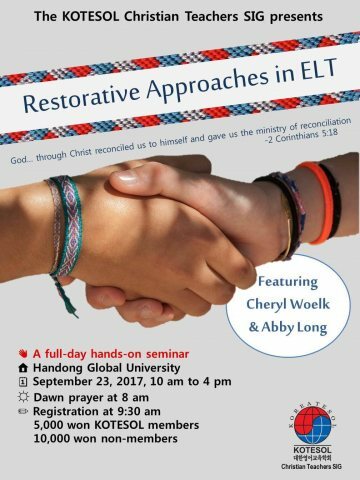 It will be a full day hands-on workshop on Restorative Approaches in ELT at Handong University on September 23, 2017. Creating healthy learning communities is a goal that many language teachers share. Christian English teachers have a clear motivation for this as we have been given “the ministry of reconciliation” (2 Cor. 5:18). However, our training often leaves us on our own for figuring out how to do this in our classrooms in practice. Restorative approaches in English language teaching, built on the paradigm of restorative justice in education, can help teachers and students to better communicate with each other, solve problems together, address conflicts that arise in class, and find empowerment to use this skills beyond the classroom as well. This workshop aims to introduce restorative approaches in ELT and give participants a few concrete tools that can be practiced in their classroom settings. We will begin the day with modeling the kind of community-building activities we can use in our classes. We will then consider the concept of restorative justice in education as applied to English language teaching through interactive and reflective tasks that help participants to link theory and practice as it pertains to their contexts. Participants will also have an opportunity to experience a few key practices of restorative justice in education, followed by a discussion of the strategies and how they might apply to diverse contexts. We will end the day with more detailed discussion of application with some concrete ideas for follow-up in participants’ programs and classrooms.